Do you accept me as your princess? Why do you want this character? : She was my original Equestria roleplaying character. Many people know me as this alt. I feel I relate to her very well. Best Princess. How often are you online? : Anytime between jobs. Age: Unknown? Immortal? Over one thousand years. Cutie Mark: Black splotch with a silver crescent moon. Short Introduction: Princess of the Moon and Guardian of Dreams, Luna has become much gentler to the ponies of Equestria since her 1000 year banishment. She is often more serious and skeptical than her sister, Celestia. Luna visits the dreams of ponies, watching over them, and helping them to conquer their fears and better themselves throughout the night. She is gentle and kind, though can sometimes seem harsh. Backstory: Over one thousand years ago, the two sisters, Princess Luna and Princess Celestia ruled Equestria together, the eldest, Celestia, raising the sun to bring about the day, and the younger, Luna, raising the moon to bring about the night. One night, the younger sister, angered that all the ponies reveled in her sister's sunlight, but always slept through her own beautifully created moonlight, decided to refuse to lower the moon to make way for the day. 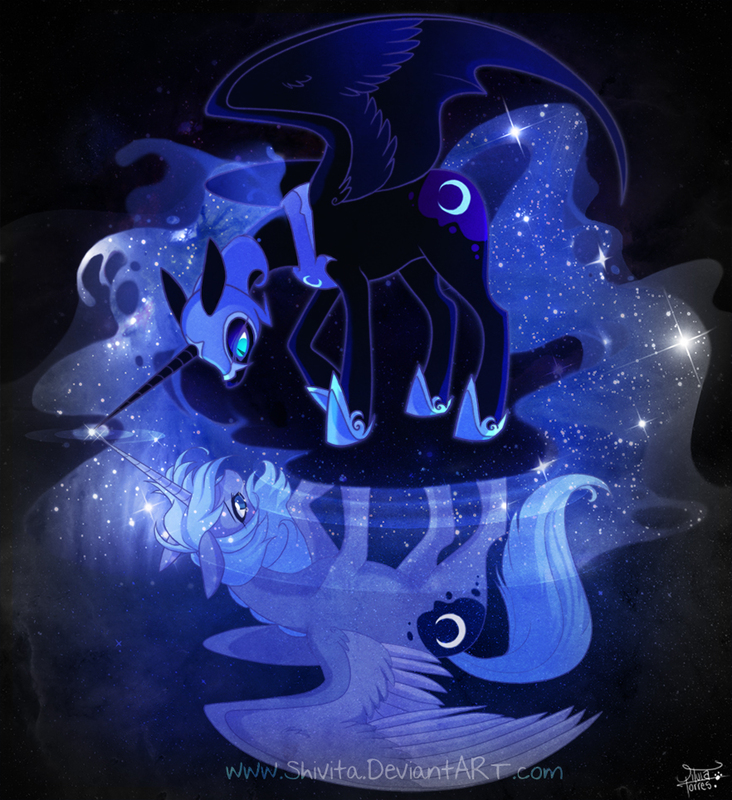 The corrupted Luna turned into Nightmare Moon, and was cast to the moon by her elder sister. After the thousand year banishment, Nightmare Moon returned to Equestria, trying to once again cover it in eternal night. She was defeated by Twilight and her friends, and reverted back to her weakened, Princess Luna form. She returned to her sister's side, where she currently remains, back to full power. Luna: Dark blue/ indigo colouring with a black splotch and crescent moon upon her flank for her cutie mark. Being an Alicorn Princess, she has both wings and a unicorn horn. Her hair and mane are both of a starry-night-sky whisp, complete with stars. She dons royal, silver horseshoes, a black necklace with a silver crescent moon on it, and a black princess tiara. Nightmare Moon: Black fur with a purple splotch and crescent moon of silver. Her main and tail are even more whisp-like, though retaining their colours and stars. She wears matching "darker" silver horseshoes, necklace, and helmet, which does not cover her horn. Personality: Luna is more skeptical and less trusting than her elder sister. Despite this, she helps other ponies to better themselves and conquer their fears, often via their dreams. 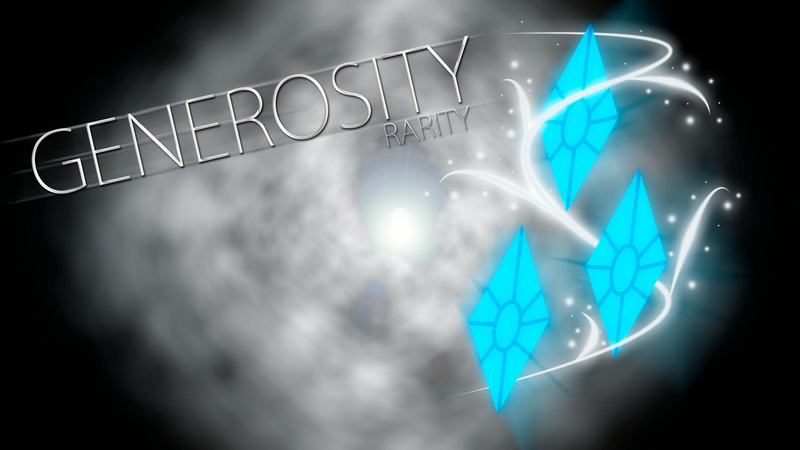 She is kind and understanding to those who feel inferior to others, or perhaps a tad "unloved", due to her past. Job: Princess Luna raises the moon to bring on the night, and lowers it to make way for the day. She also help protect ponies' dreams. Sample Post: Luna walked along the dark, forest path, looking around to get a lay of the newly thought-out land. She was in the dream of a small pony, who seemed to be greatly afraid of the dark. She found a small cave, not a single amount of light seemed to escape it's dark oblivion. She stepped inside, the shallow cave immediately showing to small, scared pony. "Do not fear, young one." She spoke calmly to them. "Allow me to show you, there is nothing to fear from the dark." She allowed the light from her horn to grow, showing all of the cave's interior. "In the dark is no different from light. I pray you, young one, rest easy, as the shadows do not bring harm." She smiled sweetly, hoping to quell the poor pony's fears of her beloved element.